September saw new vehicle sales continue their decline, according to the latest sales data from the National Association of Automobile Manufacturers of South Africa (Naamsa). 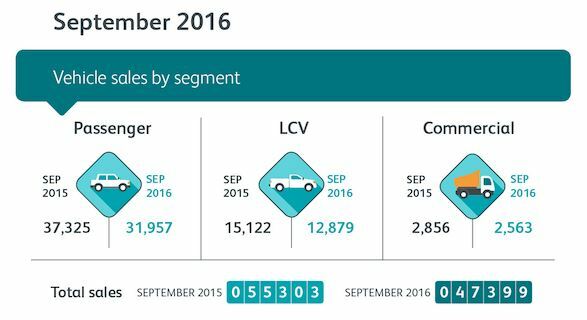 Only 47 399 new vehicles were sold in the past month, representing a decrease of 14.3% compared to the same period in 2015. Year-to-date, total industry sales have fallen 11.3% – close to WesBank’s forecast that the market would shrink 12% in 2016. Despite September being the end of the quarter, which usually sees attractive deals to aid in meeting targets, new vehicle sales saw a sharp decline. The majority of vehicles in South Africa are sold to consumers through the dealer channel, where sales of passenger vehicles and Light Commercial Vehicles (LCVs) fell 14.4% and 14.8%, respectively. The contraction in the market is attributed to both rising prices for new vehicles as well inflation affecting consumer budgets. New car prices have soared and in September this year the average new car financed cost R293 343, or 18% more than the same month last year. Along with higher prices for new cars, consumer budgets have to accommodate higher living costs and interest rate hikes. However, without a corresponding increase in income their budgets have become strained and they are unable to afford additional debt. This is reflected in the 18% drop in demand for new vehicle finance this past month. Seeking value and more affordable instalments, buyers have turned to the pre-owned market. Application volumes for used cars have grown 6.7%, year-on-year, and this demand has driven up prices. The average deal value for a used car, for September 2016, was R191 236 – an increase of 8.7%.